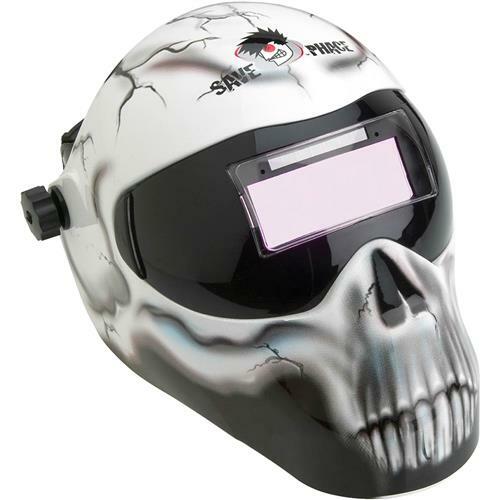 With a 180° lens design and a weight of less than 10 ounces, this welding helmet tops the charts with the largest viewing area and the lightest helmet in the world! Made from high impact ABS plastic and ANSI, CE, AUS/NZ And CSA Approved. Includes a high quality ADF fixed shade 3/10 and a 9 point, adjustable halo headgear with replaceable sweat absorbent headband. 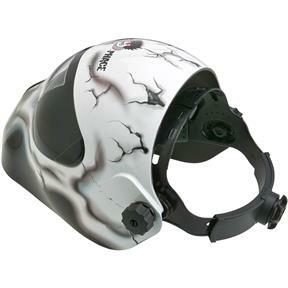 Comes fully assembled in an awesome helmet bag. Black with skull design. Meets or exceeds ANSI Z87.1 and CE EN175:1997 and CZ EN:166 standards.